Thinking back Blue Ox cues me to our time as a family visiting Paul Bunyon Park in Northern Minnesota. Gorgeous and fun. I do remember a childhood video ( I grew up with a photographer father) of me losing my pristine white sandal in the muddy Babe, the Blue Ox area. I cried. That's what the whole video is about, me sad about losing my shoe in the mud, knowing there might be hell to pay. There are also highlights of Babe and Paul speaking to us. Super cool technology for the day-the badass 70's. 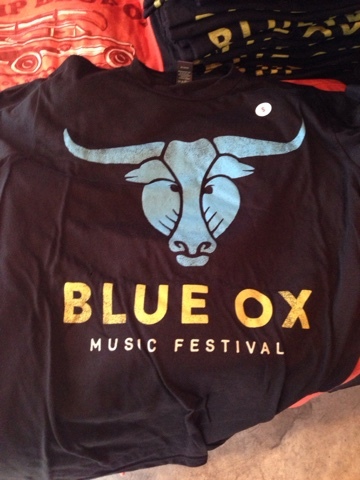 Fast forward in crazy time warp speed I'm now at the Blue Ox Music festival, camping, and listening to amazing bands. Leftover Salmon 💜, the Big Wu, the Last Revel, Sam Bush, Shovels and Rope, The Del McCoury Band, and Bela and the Flecktones. That's just the bands that I personally recognize or have heard. Wow! F-(/)/&:& yes. Dynamic music, beautiful WI scenery, great Bell's beer. Come on over. Sit a spell- my husband and Paulie will be happy to play a bit with you.